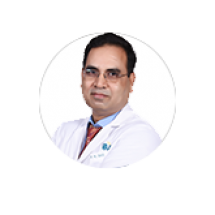 Dr. Das has immense experience as an Oncologist in treating all types of Cancer patients in leading centers in New Delhi. As a Professor of Medical Oncology, he did fellowship training in advance hemato-oncology treatment and bone marrow transplant at Peter–Mac Cancer Center, Melbourne, Australia in August 2007. He has over 27 years of experience of satisfied patients in his field. He was nominated for Medical Excellence Award for excellence in the field of Oncology in India by Havard Medical International Community service. He was Selected as D.N.B. examiner for medical oncology by Health and Family Welfare department of the government of India. He is a Lifetime member of ISMPO (Indian Society of Medical and Pediatric Oncology). He is nominated for Medical Excellence Award for excellence in the field of Oncology in India by Havard Medical International Community service. As research work, he circulated micromegakaryocytes in Chronic Myeloid Leukemia. In 2013, he was selected as a member, Expert Advisory Committee on Oncology for the Six new upcoming AIIMS at Bhopal, Bhubaneswar, Jodhpur, Patna, Raipur, and Rishikesh, under Ministry of Health & Welfare, Family Govt of India.